TaylorMade is marking the 10th anniversary of its Spider putter brand with the launch of the new Spider X. Continuing the longstanding heritage of Spider performance in a completely re-designed frame, Spider X putters utilise a new weighting system and optically engineered sightline featuring TaylorMade’s new True Path alignment system. The new alignment system comes on the back of research derived from more than 10,000 putts from a distance of 12 feet, with results illustrating that golfers strike the ball toward the toe of the putter 66% of the time – this is the result of a parallax effect. As a result, engineers strove to re-engineer the mass properties of the putter head while simultaneously introducing a new alignment system – True Path – for easier alignment enhanced focus, leading to more putts struck on the centre of the face and thus eliminating the parallax effect. The new Spider X features an optically engineered vision system designed for improved path, clearer vision and enhanced visual perception through color sensitivity. The more stable head shape provides more weight on the outside of the frame (36% on both perimeters v 30%), with a centre of gravity which is three times deeper than a traditional blade putter. The new frame features three new weights: aluminum (2g), steel (6g) and tungsten (12g) to allow for optimised weight preference. Additionally, the Spider X features a composite core weighing 15g. The putter’s new head design was created using multi-material construction, delivering a slightly smaller head shape compared to the Spider Tour. Engineers reduced the size of the Spider X by 5% but were able to maintain the same MOI as Spider Tour within its new construction. Spider X putters incorporate a new, thicker 5mm Pure Roll white surlyn insert for improved sound, feel and roll characteristics. The 12-groove Pure Roll insert promotes forward spin for smoother roll, greater accuracy and better distance control. The composition and construction of the new insert is specially engineered to bring the grooves into direct and active contact with the ball during impact, even on short putts. The 0.5mm grooves also serve to soften the insert’s structure. Together, these factors are designed to make the insert deform at impact, putting the grooves into direct contact with the cover of the ball. Available at retail on February 15 at an RRP of £299, Spider X putters will be offered in copper & white or navy & white. 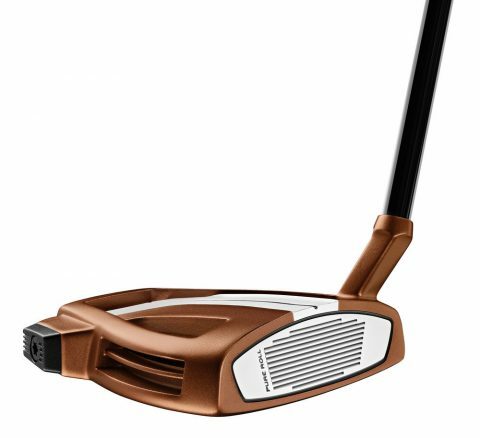 The copper & white model will be available in a short slant or single bend (RH only) hosel option, while the navy & white model will be available exclusively in a short slant offering. Each is available in 33”, 34” & 35” lengths and comes with SuperStroke’s Pistol GTR 1.0 grip.